We’re committed to providing the best in financial management and accounting services in Central Alberta and across Canada, so our clients can focus on what they do best: growing their business. 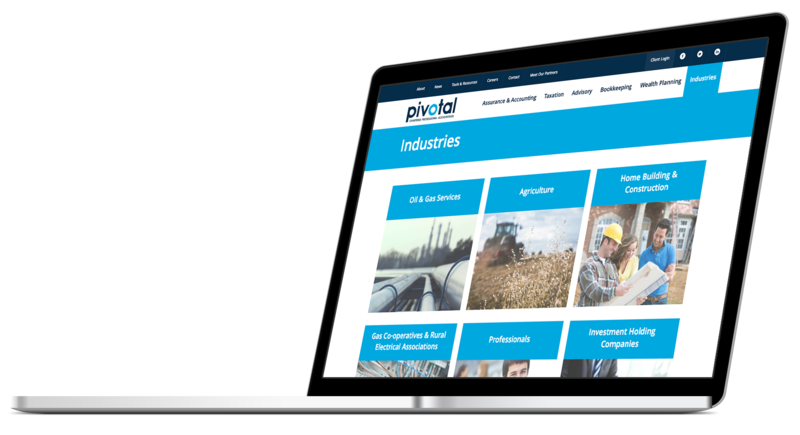 Pivotal LLP is an independent public accounting firm with a "Can Do" philosophy that reflects the dynamic nature of our clientele. Located in the Gasoline Alley commercial area along the Queen Elizabeth II Highway just south of Red Deer, our firm combines a small town personal touch with the professionalism, innovation, superior performance, and expert guidance you'd expect from a firm of our calibre and size. We continue to provide the friendly face, the caring attention, and the quality workmanship that our clients have expected and enjoyed for over 55 years. Cloud accounting is the future. It helps you efficiently manage your financial reports in a way that keeps you out of our office and getting on with your job. Automatic updates, backups, and reduced cost to your infrastructure. We are a progressive accounting firm with a forward-thinking outlook. We encourage and challenge our new team members beyond their technical training to gain real world experiences to enrich their designation within a very short timeframe. For cooperative students and students who article with us, we look to their future within our firm as leaders both here and in our community.